The Carolina Bamboo Garden was launched on May 6, 2000 in Sitio Tanza II, Bgy. San Jose, Antipolo City. The place which houses both indigenous and exotic varieties of plants is a fine venue for conducting researches on the various aspects of bamboo production and utilization. The garden was named after its founder and owner, Mrs. Carolina Gozon Jimenez. 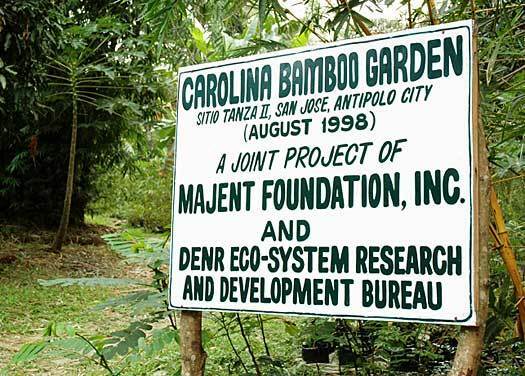 The bamboo garden is a project of the Majent Foundation and the Ecosystem Research Development Bureau (ERDB). It aims to serve as show window of bamboo research and development and an information center for individuals interested in putting up bamboo plantations. Its vision is to help create ecologically balanced and clean environment by way of propagation and distribution of best quality exotic and indigenous bamboo seedlings, and to promote best environmental practices through research and development. 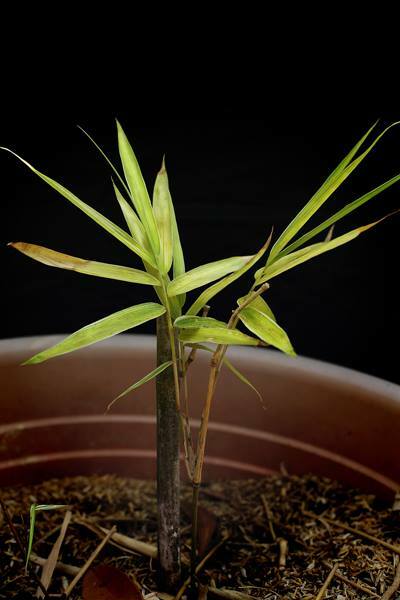 There are 45 bamboo species that have been collected and successfully cultivated in the Garden with the total area of 5 ha. In the garden, one has a good opportunity to enjoy diverse bamboo species, such as, Bayog (Bambusa sp. 1), Black bamboo (gigantochloa), Buddha’s belly (Bambusa tuldodes), Giant bamboo (Dendrocalamus asper), Yellow bamboo (Bambusa Vulgaris var. striata) and many others. Planting stocks used were offsets, culm cuttings and seeds. You will not be disappointed when you visit the Carolina Bamboo Garden. I came to the world of bamboos because I was attracted to it starting from my early childhood. Way back then, as a youngster, whenever we take a trip to Baguio, all along the highways are scenery, rice lands with backdrop of bamboo. I love the delicate lace-like silhouette of bamboo leaves and I am thrilled at the musical sound I hear. In the year 1998, my mother decided to give me a 5-hectare lot from her land holdings in Antipolo City. I developed the area to show her that I appreciated her gift. Since there were 4 of us children and we were asked to choose which area we will get, I invited my friend, Mr. Mody Manglicmot, who is a well-known landscaper, gardener, bonsai king, to help me. He chose the area near the creek and that was it. Having visited bambusetum in Baguio and learning so much about bamboos, the idea of bringing this information through a bamboo garden, closer to the thickly populated Metropolitan Manila, started the development of the area into Carolina Bamboo Garden. Through the assistance of the Ecosystem Research and Development Bureau in Los Baños, Laguna, a bambusetum came about.